Snow Doesn’t Forget Homeless, Why Do We? Last week, a majority of the United States experienced an extreme decrease in temperature and wind chill known as a polar vortex. New York City reached temperatures as low as one-degree Fahrenheit. In New Paltz, temperatures dropped into the negatives. Parts of the United States, including Chicago and Milwaukee, reached temperatures lower than Antarctica, Alaska and Siberia. While bundled inside with heat, warm clothes and a mug filled with a hot beverage of your choice, it was easy to forget about those less fortunate during this time. According to the United States Department of Housing and Development, there were over 550,000 people experiencing homelessness in the United States as of 2017. Of those, 31 percent were reported as being unsheltered. In Nov. of 2018, the Coalition for the Homeless reported that there were over 60,000 people experiencing homelessness in New York City alone. The effects of extremely cold weather on those experiencing homelessness are not only uncomfortable, but oftentimes fatal. 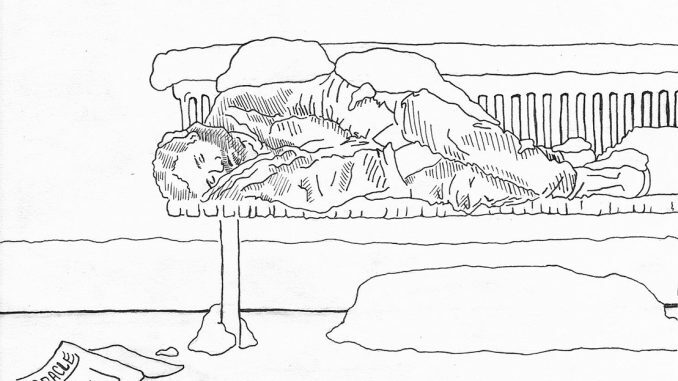 Hypothermia is the most obvious threat to the homeless when temperatures begin to drop. According to the National Coalition for the Homeless, hypothermia can set in once temperatures drop below 50-degrees Fahrenheit. However crisis shelters often don’t open until temperatures reach far below that. In New York City, for example, these shelters only begin operating once the temperature reaches 32-degrees Fahrenheit. Even when shelters are readily available, many people prefer to risk their lives living on the streets rather than reside in one. An article published by Daily News in 2016 referenced a report that concluded that in one year alone, there were around 1,687 violent attacks in shelters. With most shelters’ staffs primarily consisting of volunteers, these attacks arise when a lack of training leads to a lack of knowledge on how to handle violent situations. Of course, living on the streets is not a much better option. In many big cities in the United States, benches deemed “anti-homeless” and “un-sleepable‚“ exist. These benches are often split into sections via large handles, making it nearly impossible for one to rest on them. Due to this, those experiencing homelessness in these cities are forced to seek shelter on sidewalks and streets. We at The New Paltz Oracle believe that every person, regardless of financial standing, deserves comfort and livable conditions at all times, though especially during extreme periods of cold like last week’s polar vortex. As a town that prides itself on community, we cannot ignore those members who are in need. Based on a report published by the New York State Office of the Comptroller in June of 2016, there were an estimated 343 people experiencing homelessness in Ulster County. Here in New Paltz, many people are not even so much as aware of the number of homeless individuals. No one can solve homelessness overnight, but the solution must begin with acknowledgement of the problem. Familiarize yourself with what resources are available to those experiencing homelessness, stay informed on the numbers and most importantly, don’t ignore the issue. In New Paltz, more resources for those experiencing homelessness are vital. The nearest shelter actively listed in the “Homeless Shelter Directory” is located in Rosendale, over eight miles away, and is only open to youth. The next closest is located in Poughkeepsie, which is situated nearly nine miles from the center of town. Both of these shelters note that there are shelter limits due to lack of space and staff. The resources that already exist must also be made more readily available. Food pantries exist both at the Family of New Paltz and on SUNY New Paltz’s campus, though a thorough search on the internet found no information on local soup kitchens. While these may exist within the town, how can we expect those in need with no access to the internet to locate them when those with unlimited access cannot? We at The Oracle believe that more needs to be done to help those experiencing homelessness in our town and those surrounding. This begins with acknowledgement and an increase in useful resources. Within our own campus community, there is a lot that can be done for the homeless. Our campus is centrally located in town, and has plenty of space to host resources for those experiencing homelessness. A weekly soup kitchen run by student-volunteers would be a great addition that would benefit the community as a whole immensely. Student-run philanthropy organizations can also help out the homeless by hosting food drives, creating care packages and collecting winter necessities that are vital in these cold months. Along with this, food left over at the end of the night or week could be donated instead of thrown out. At closing time each Friday, unsold food from the Student Union Building like pre-packaged sandwiches and salads are handed out to students. While the gesture is certainly a kind one, this food would be much more useful to those in need. Though the polar vortex has concluded, winter is far from over. We believe it is important to keep those who are without shelter, as well as those lacking proper resources to stay safe, in mind during this season. There are still many steps that can be taken to end our country’s homelessness epidemic and keeping those experiencing homelessness safe should not only be a priority for government officials, but for everyone.